History contributes to the development of tolerance and the understanding of other beliefs, cultures and societies. It also promotes citizenship, literacy, numeracy and the understanding of social responsibility. By the end of Key Stage 3 students will have considered how the past influences the present, what past societies were like, how these societies organised their politics, and the beliefs and cultures that influenced people’s actions. As they do this, students develop a chronological framework for their knowledge of significant events and people. This will help them understand more about themselves as individuals and members of society. What they learn can influence their decisions about personal choices, attitudes and values. Students are given the opportunity to look at various aspects of British History, from the Romans to the Industrial Revolution in Year 8 and the World Wars in Year 9. Throughout the year students will be given the opportunity to develop their knowledge of History outside of the classroom, through trips. The trips that the History department go on include: Lancaster Castle, The Maritime Museum and Manchester Imperial War Museum. 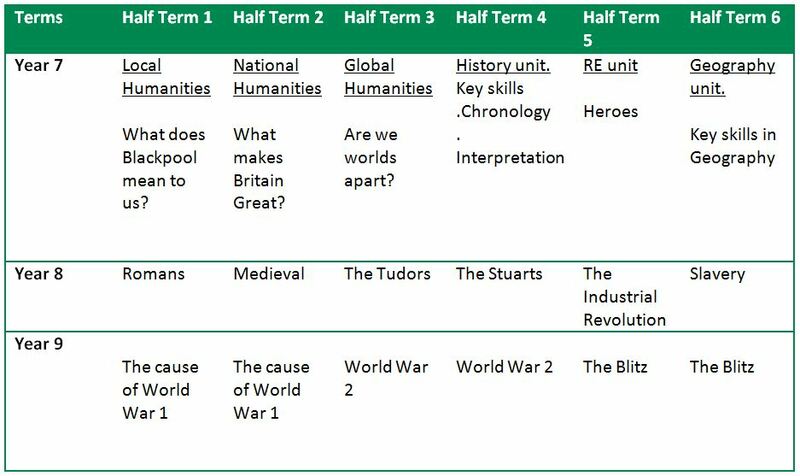 The skills developed in Key Stage 3 are essential for students who follow the two year WJEC GCSE History course. They are expected to recall, select, organise and communicate a range of historical knowledge. Students evaluate and use critically a wide range of historical sources of information to investigate historical questions, problems or interpretations. They reach reasoned and substantiated conclusions about past events, people and places. The course has four components. Paper one focuses on America 1919-1929, paper two Germany and the Rise of the Nazi Party, paper three Britain during World War Two. The final component is a controlled assessment. This takes the form of a historical enquiry, the content changing each year. Throughout the course students are provided with opportunities to study history in a variety of ways – in depth, through time, in a local context and from different cultural perspectives. This will help students appreciate the diversity of the societies studied and the experiences of the people in these societies.